The main branch of the Portsmouth, Ohio Public Library may be one of the most beautiful libraries in the tri-state...and it may also be one of the most haunted. 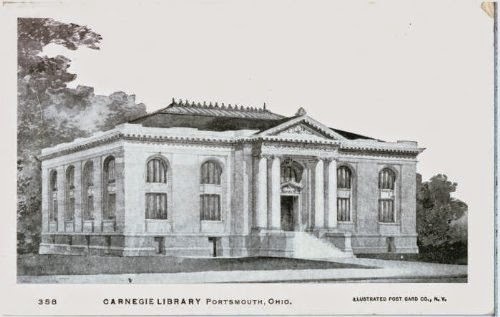 The current library, which sits on Gallia Street in downtown Portsmouth, was built in the early 1900s. In 1902, local resident Henry Lorberg appealed to philanthropist Andrew Carnegie to donate toward the building of a new library facility for the area. A $50,000 donation by Carnegie that year resulted in the beautiful building of today, which opened on February 1, 1906. It was built in the classic Carnegie style by the architectural firm of Richards, McCarty and and Bulford. In order to keep up with the demand of the growing needs of the community, additions were constructed in 1971 and 1995. A massive genealogy and local history section make this stunning library a wonderful place for the paranormal researcher to conduct historic research, and one could spend hours poring over all the resources the library has to offer. As an added bonus, one might also actually encounter a ghost while visiting! According to local legends, the library is haunted by two different ghosts. The first is a woman named Grace. History isn't clear as to whether Grace was an employee or patron of the library, but the story goes that she fell of the library balcony and was killed. This section is now closed to the public, but Grace's ghost has still been seen wandering the area. The second ghost to call the library home is a homeless man who frequented the library before HIS death, and possibly even died there in recent history. His ghost can be seen wandering among the stacks. Both Grace and the homeless gentleman seem to prefer the original 1906 section of the building, avoiding the newer wings. Together they seem to be responsible for any number of strange activity which goes on there, particularly turning lights on and off and stacking books in strange ways.